Tons o’value, fun and weight! We passed like ships in the night. Probably a dark and stormy night, to be even more clichéd. When we first moved to Naperville in May of 2006, there was an amazing used bookstore a little over a mile from our house. BookZeller— a play on book seller and book cellar I imagine–was a playground for word nerds such as me and my loved ones; a basement rabbit warren of room after room containing shelf after shelf of used books. And this was no specialty affair catering only to prowling genealogists or wan science fiction fans: every genre was represented with depth and discernment. It did last long enough for our friend Sean to go missing several times during the infamous 40th Birthday-Weekend-Laminated-Extravaganza! for Sydney. But as I said, alas. By November, 2006, it was all over. Not exactly out of business, but certainly gone, reinvented as a used book wholesaler, operating only out of a warehouse and on the internet. With my on-going effort to reduce our accumulation of books, I called BookZellar to see if their used book buying service would be a good option for my goals of decluttering, making a little money and not losing it all to postage costs. The gentleman I spoke with was quite pleasant and said they would be happy to look at the inventory of books I had compiled, and that they typically pay 50 cents to one dollar per book. 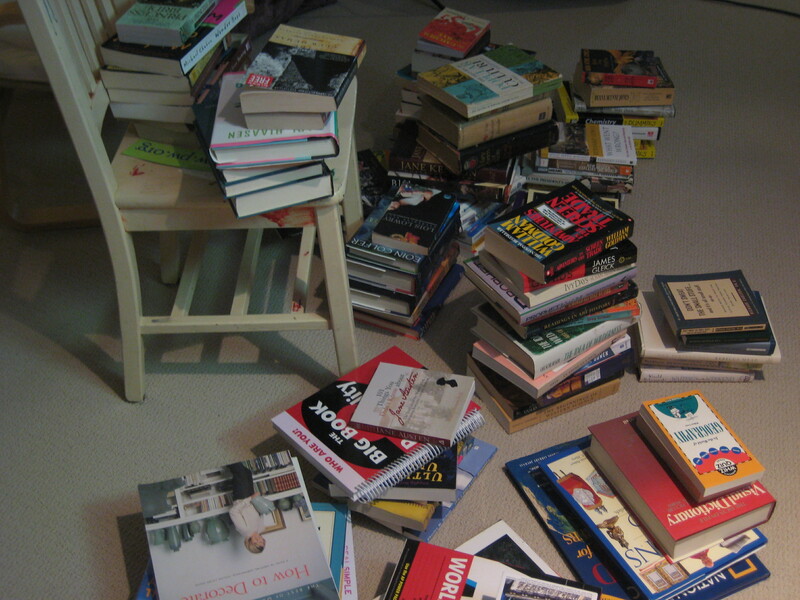 Quick calculation: I have inventoried 127 books so far. Let’s say they were interested in about half or 60. Say half of those were paper and half were hard covers. That means I would make $45 for selling 60 quality books. I don’t feel great about this. I know that’s better than I could do at a yard sale where books typically go for 25 cents/paper and 50 cents/hard cover—if that. And I investigated selling books on Amazon, but that seems to require the same blithe disregard for spending all your earnings on postage that eBay selling requires. Plus you have to deal with the Ohmygawd Crazy People. Where does that leave me? Good question. First of all, it reinforces my commitment to not buying books, unless, UNLESS they are really truly forever and FOREVER books—a calculation made through a series of physical and mental challenges and arbitrated by Paul. And he’s tough. He was a mountain man who could only bathe once a month. So that keeps the future book problem from expanding like black mold on a mountain man. But what do I do with the books I am ready to relinquish? Relinquish– but for which I would like a bit of compensation? BookZeller’s former space has been reconceived as a hip clothing boutique/sometimes punk-music venue called No Exit. I’d like to think the new name is a nod to the ghost of Jean-Paul Sartre. I suspect, however, it’s a reference to local law enforcement’s most frequent justification against allowing large crowds of moshing teenagers into a one-flight down, claustrophobic firetrap. No Exit is also feeling like a very literal description of my old books. I think $45 is pretty good money. My mom donates her books to the library book sale, and then goes to the sale and buys dozens more. The good news is, there is always something to read at Mom’s house. The bad news is, someday she is going to die and my sister and I are going to have to sort through all of it. Donations to the Friends of the Library book sale are my preferred method of un-possessing books. However… times are what they are. Yes, $45 is not bad, but I was hoping just this time to do a little better. I know I’ve donated 1000s of dollars of books through the years, so like I say, just this time, I was hoping for a little better return on investment.